You'll get in some beach time at Waikiki Beach and Sunset Beach Park. 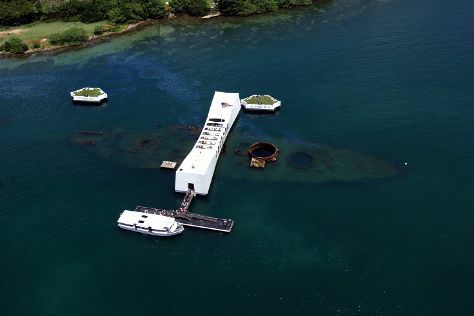 Get a sense of the local culture at USS Arizona Memorial and Iolani Palace. Venture out of the city with trips to Kailua (Kailua Beach Park & Lanikai Beach) and Pu’u O Mahuka Heiau State Monument (in Pupukea). There's much more to do: take in the pleasant sights at Diamond Head State Monument, identify plant and animal life at Hanauma Bay Nature Preserve, examine the collection at USS Bowfin Submarine Museum & Park, and pause for some photo ops at King Kamehameha Statue. To see other places to visit, more things to do, traveler tips, and other tourist information, read Honolulu trip itinerary website . Florianopolis, Brazil to Honolulu is an approximately 30-hour flight. Due to the time zone difference, you'll gain 7 hours traveling from Florianopolis to Honolulu. In April in Honolulu, expect temperatures between 33°C during the day and 25°C at night. You will have some time to spend on the 18th (Thu) before leaving for home.